First a small tech-y note: I am so sorry for anyone having trouble finding my blog lately. Something crazy happened in the move from solvi.se/delfinelise to delfinelise.com resulting in the death of the old blog – instead of it just redirecting here. I honestly don´t know what happened, and I am sorry for the broken links and such this has caused you. So thanks for the patience! And please make sure to follow my new domain instead of the old one, as it won´t redirect automatically. Thanks! I love Elsa Schiaparelli. Both as a designer, but also as a woman – she was waaaay ahead of her time, and I thank her for it! 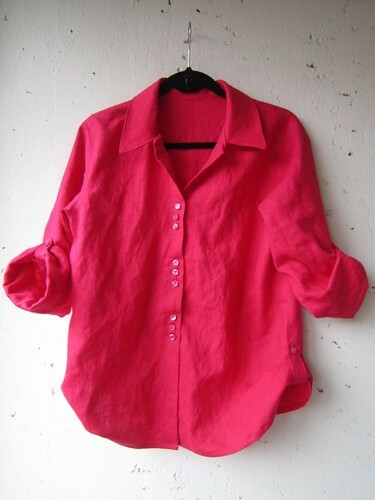 I especially love her shocking pink color, with the hex number #FC0FC0. It just screams life and adventure to me. I have too few shocking pink garments in my wardrobe! So I decided to do something about it. This shirt is inspired by my buddy Morgan over at Crab & Bee. She has made the most amazing, orange shirt using McCall’s 6436. I used BurdaStyle 03-2013-124 for my version. The fabric was bought specifically for this project, as I didn´t have a fitting amount of linen fabric in my stash. Since moving back to Oslo, I´ve found it much harder to find good quality fabric in thrift stores. I actually sent an e-mail to the biggest chain wondering why they didn´t have more fabric in the stores. The answer was that the demand for it was so small! Can you believe it? I though the whole point of thrift stores was that you could find everything there. Not just the things there were a demand for. But that´s obviously all wrong… So – I bought this fabric. Brand new. I got it at my favorite fabric shop in Oslo, Rainbow Tekstil. They have everything! My goodness. Hand stitched lace fabric for 500,- NOK per meter (that´s approx. 75 USD, or 50GBP)? Check. Cheapo cotton poplin for 20,- NOK (3 USD, 2GBP)? Check. 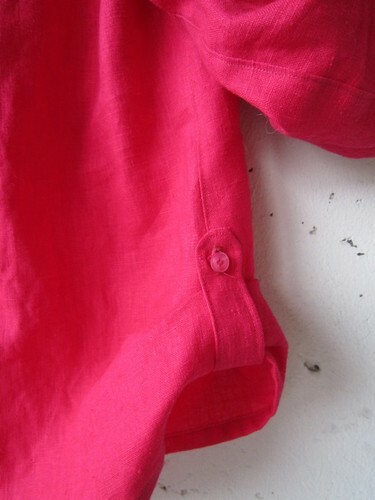 And my linen in the most amazingly vibrant pink color? Check. 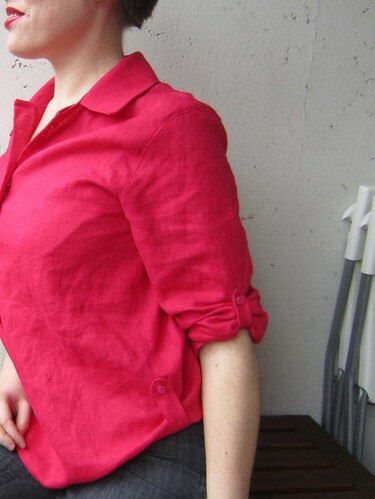 As this style isn´t fitted, I took a chance and skipped the FBA, and just made the shirt one size bigger than I´d normally would. Worked like a charm! It was quite easy to make. It did take a lot of will power though, to make all those buttonholes – there are 17 in total! In the pattern there are “only” 14, but I didn´t notice until after I´d started to stitch them that I had marked too many on the front. Oh, well. I like my extra set of buttons! I am very happy with my new shirt – I can´t wait to wear it, I am certain it will become a wardrobe staple during the summer months. What a fabulous colour! Your shirt looks great and really suits you. 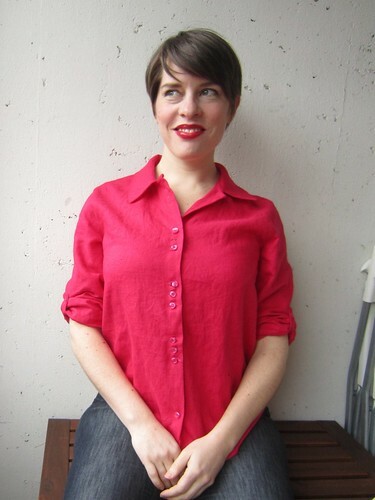 Hi Solvi… Your shirt is totally darling and you look great on it. I love the side tab and the fabric color.